"What I wanna see are hands, body, head, eyes, jaw... Okay. Action!" In a mist-shrouded cemetery, completely created by the filmmakers in an olive grove some 30 miles north of Los Angeles, writer-director Dan O'Bannon is rehearsing the filming of a mechanically-created skeleton rising up out of the ground as one of the zombies in the Hemdale/Fox Films production Return of the Living Dead for Orion Pictures release. A master screenwriter responsible for such dynamic films as "Alien" and "Blue Thunder," O'Bannon directed his first feature film. "Swamp Thing," "Beastmaster" and "Brainstorm." "Dan was very explicit in specifying the look and texture he wanted," says Munns. "He was explicit in terms of the coloration, everything being an old brownish quality, looking like old dried skin shrivelling up on bodies. And he was very specific about the zombies having vivid characteristics with distinct personalities so that you sense they were real people who lived." Noted production designer Bill Stout was the person responsible for the overall look of the film. His work has been seen in such films as "First Blood," "Conan, The Barbarian" and "Conan, The Destroyer." A fan of melodramatic 19th Century sculpture and symbolist art, Stout designed the cemetery in which the unit is filming. The film is set in present-day Kentucky and Stout created all the tombstones and monuments, as well as a "crying angel" statue, with mostly famous old Southern names on them. ("My wife is from Louisville, Kentucky, and she gave them to me," he comments.) His designs also included the building of the exterior of the film's mortuary at one end of the cemetery, the construction of hills and roads through the cemetery, the planting of grass throughout the area and dressing the olive trees with spagnum moss to simulate the Kentucky vegetation in dry, sunny California. Stout also designed the look of the zombies created by Bill Munns. "I wanted to do something different from all the other living corpse movies," he says. "I wasn't so much interested in gore, basically what I wanted to do was show when people died. I was more interested in general deterioration of the bodies." Part of his inspiration came from the Mummies of Guanjuanato, a small Mexican village where the bodies of local people have been kept in various stages of deterioration ranging from two to 100 years-old. Adds Stout: "Detail is all important in this type of film." As just a small example of such detail, the production designer had more than 100 mushrooms made to be planted in various parts of the cemetery "to add to the richness of the look of the film." 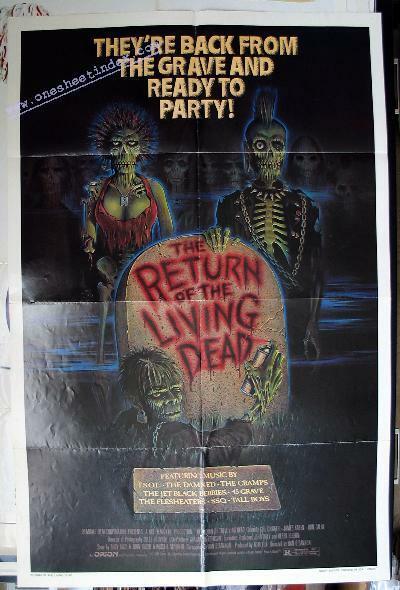 A wealth of talent and experience has been put into the making of Return of the Living Dead stretching the imagination and creativity of the team involved. Bill Munns' comment perhaps best sums up the feeling of the cast and crew working on the location; "It's challenging, but a lot of fun!"